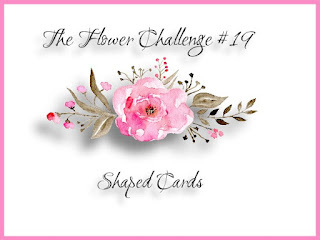 Hello everyone: My teammates and I have a new challenge for you to play with over at THE FLOWER CHALLENGEgallery, this time the theme is "SHAPED CARDS", this means for you to use any other shape except RECTANGLES OR SQUARES. 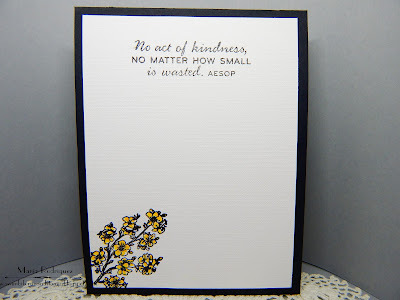 Make it an oval, circle, triangle, heart, hexagon, etc. you get the picture. 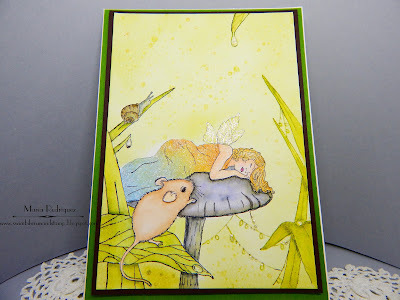 So here is my card to inspire you to come and play along. 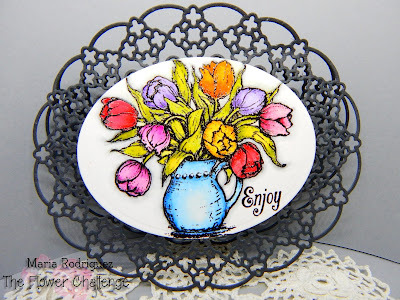 This image is from a Flourishes set called "Tulips for Friends" it's retired, but now, Power Poppy has a new version of this same image in a Photopolymer stamp set called Loving Tulips. 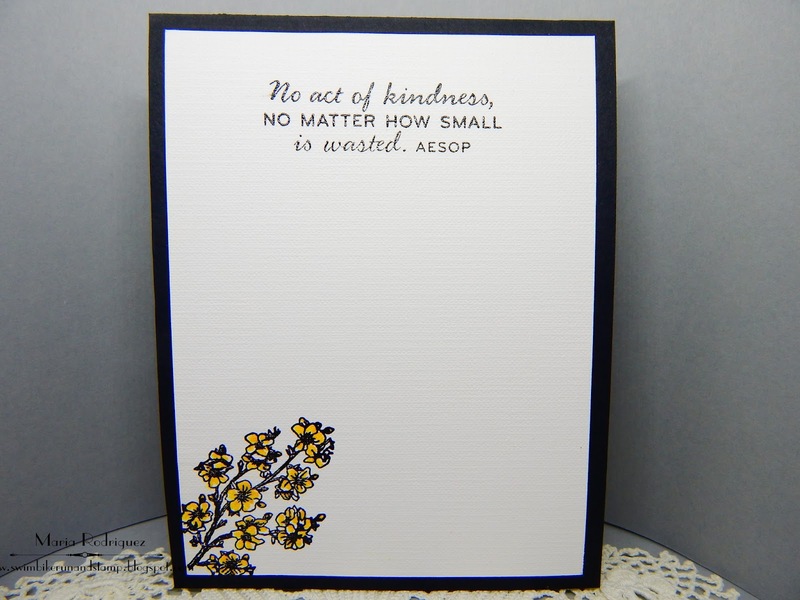 I stamped this image on a die cut piece of Strathmore 140lb. 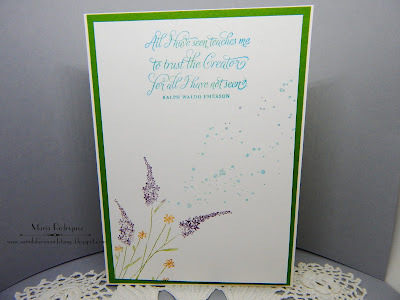 watercolor paper with Versafine black ink and clear heat emboss it then, colored it with SU markers and an aqua painter. 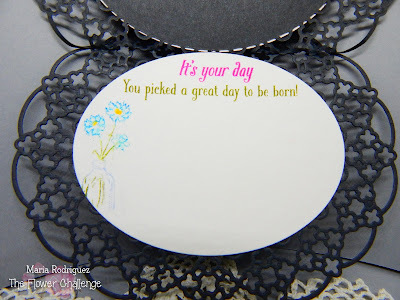 The black lacy oval was cut with the Spellbinders die set called Oval Regalia, I cut two pieces with black card stock and glue the top part for a hinge, it worked better than I thought. 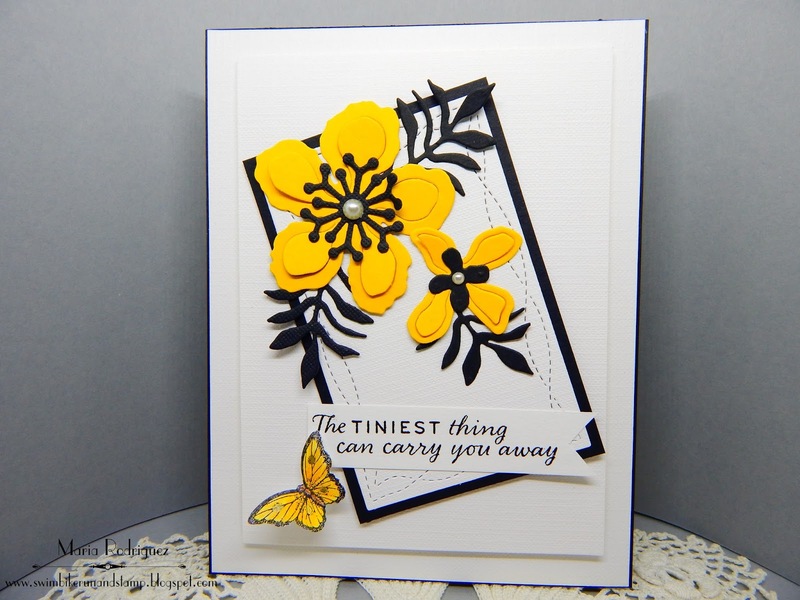 The sentiment and the flowers in the bottle are from the Power Poppy set called Go Wild. 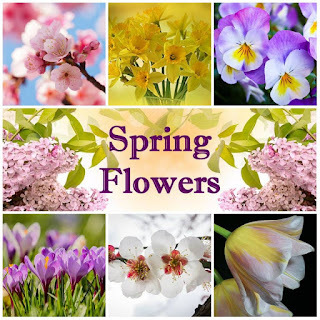 So I hope you feel inspired to join us at THE FLOWER CHALLENGE gallery, and for more inspiration please check out the amazing projects of my teammates, go to their blogs to see how they created them and leave them some comment love. 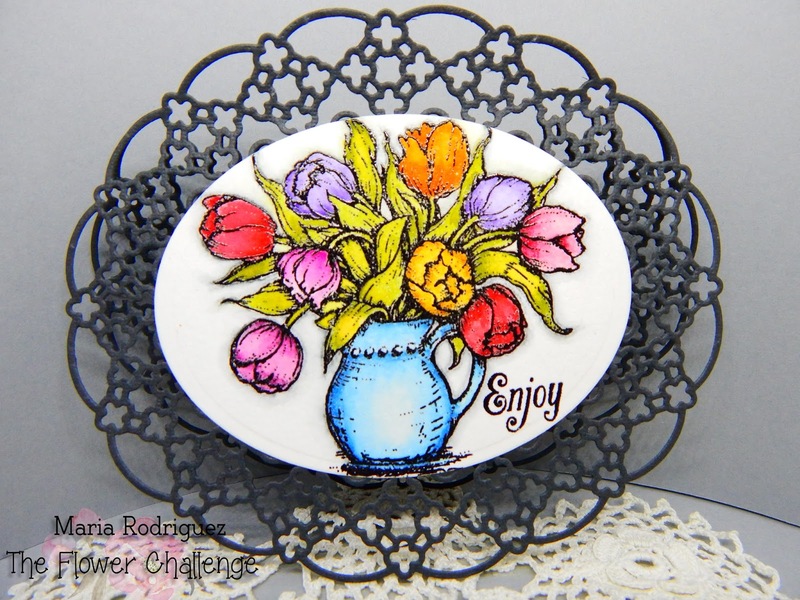 A2Z Scrapbooking linky party April challenge "Flower Power"
Always Happy Birthday Challenge "Anything Goes/option Balloons"
Card Mania Challenge #103 "Spring"
Delicious Doodles Challenges "April, Anything but a Square"
Just For Fun Challenges "Spring Flowers"
Hello again everyone: I have another card done with my amazing collection of Fairy rubber stamps. I made THIS CARD on March 26th. 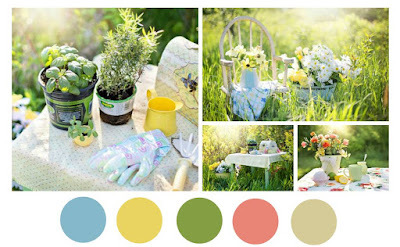 with another image from this awesome and beautiful Fairies. 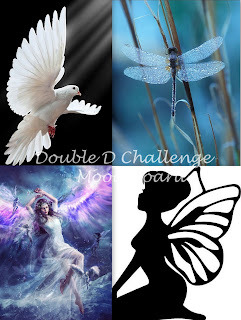 I'm slipping under the radar here to link this card to the Double D Challenge so I hope that I can make the dead line with this card. I was given this amazing collection of plain rubber stamps by my dear aunt, she found them at a thrift store and got the whole lot of 25 for $10.00. 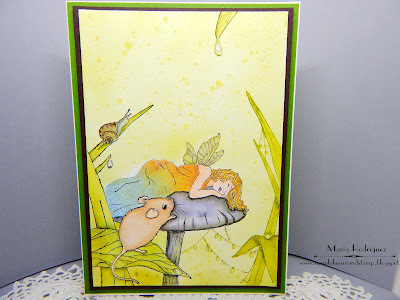 I stamped this image on water color paper with Stazon black ink and colored it with some SU markers and Sakura Koi watercolors. As I was putting some shade on the mushroom cap, I smeared black ink on the Fairy's dress, I was just staring at this black stain and I knew right there it was not going anywhere so, in an effort to save the rest of my panel, I went to my drawer of pattern papers and found a piece of one with some really pretty shades of blue and golden yellow so, I stamped the Fairy's image on this paper and fussy cut the dress and the small piece by her face, it was either this or trash the card, I think it looks ok, right? 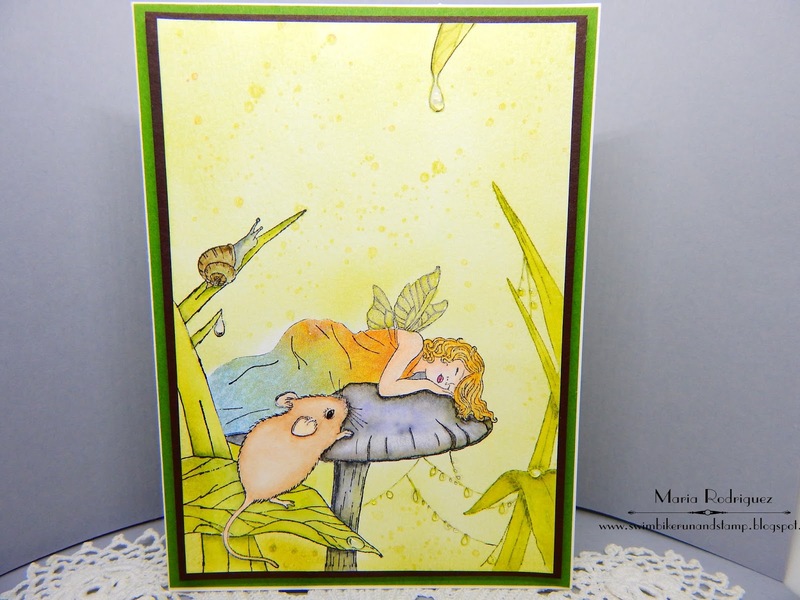 In this picture I hope you can see the shimmer of the Wink of Stella I added to the Fairy's dress, wings, a bit on her hair and her arm, after all, Fairies are totally covered in Fairy Dust, you know this! I also added some Crystal Effects to the drops of water hanging on the spider web and, of course, on the one that will drop any second now to wake this sweet Fairy from her nap. 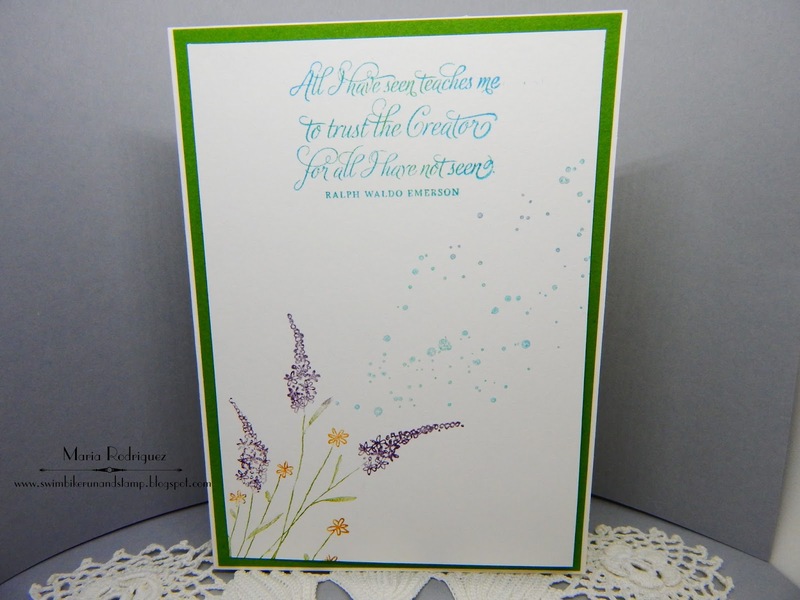 The sentiment is my favorite to add to my Fairy cards, the flower image from my stash of unknowns. 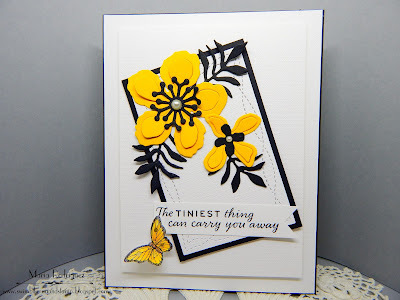 Crafting With Friends Challenge #64 "Anything Goes"
Kitty Bee Designs Challenge #115 "Spring"
Polkadoodles Crafting Challenge Week #13 "Anything Goes"